This is part 2, I guess, of my response to Jeremy Fox from his questions about the LTEE over at the Dynamic Ecology blog. What follows below are three overarching sets of questions that I hoped, long ago, the LTEE could answer, at least in the context of the simple flask-world that it encompassed. 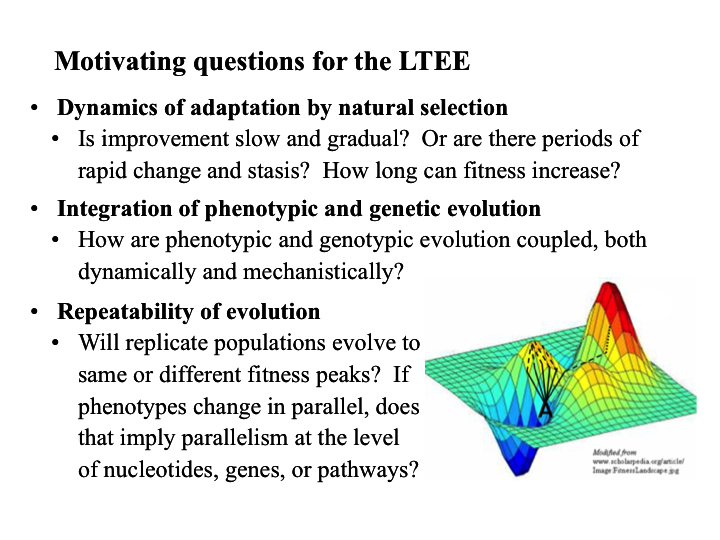 I present all three sets of questions in some of my talks about the LTEE. However, in my talks to broad public audiences – like my Darwin Day talk at the University of Calgary next week – I focus especially on the third set of questions – about the repeatability of evolution – because I think it is the most interesting to people who are not necessarily evolutionary biologists or even scientists, but who are curious about the world in which we live. A few more thoughts: The first set of questions, about the dynamics of adaptation, include ones where I had clear expectations that were testable in a fairly standard hypothesis-driven framework. For example, I was pretty sure we would see the rate of fitness improvement decelerate over time (and it has), and I was also pretty sure we’d see a quasi-step-like dynamic to the early fitness increases (and we did). Nonetheless, these analyses have yielded surprises as well, including evidence (and my new strong conviction) that fitness can increase indefinitely, and essentially without limit, even in a constant environment. In regards to the second set of questions, about the dynamics of genome evolution and their coupling to phenotypic changes–I’m sure these were part of my original thinking, but I will readily admit that I had almost no idea how I would answer them. Hope sprung eternal, I guess; fortunately, wonderful collaborators—like the molecular microbiologist Dom Schneider—and brand new technologies—wow, sequencing entire genomes—saved the LTEE. 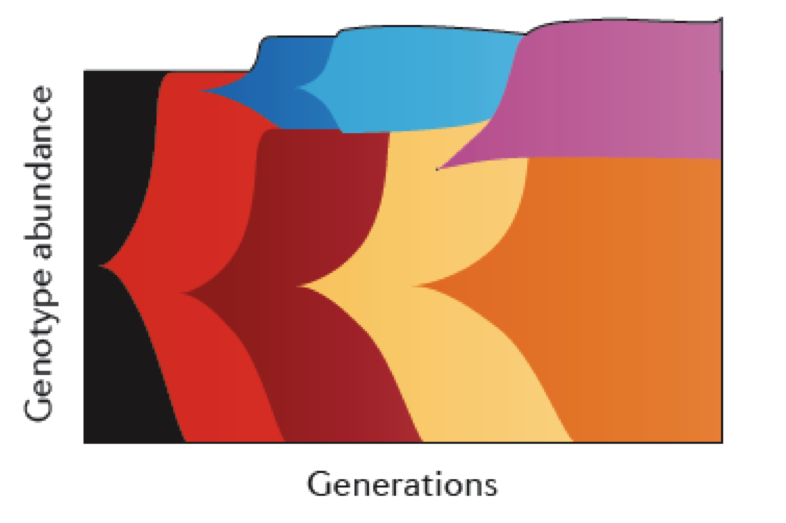 Jeff Barrick and I have written a review article for Nature Reviews Genetics on “Genome dynamics during experimental evolution.” Our paper recently appeared as an advanced online publication; the print version should be out in a week or so. Jeff did a superb job illustrating the population-genetics concepts that underpin this field, as well as organizing and synthesizing the literature. It has been such a fast-moving field that we’re both a bit embarrassed to say when the article was first proposed. However, we think it was worth the wait for our readers, given all the exciting work that has appeared since then. The first bacterial genome to be fully sequenced, Haemophilus influenzae, was published in 1995. That species was likely chosen not only because it is an important pathogen, but also because it has a fairly small genome with fewer than 2-million base pairs. I don’t know the cost of that project, but I recently heard someone say that it cost roughly a million dollars to fully sequence another important bacterial pathogen around 2002 or so. Fast-forward just a few years and I remember being shocked – along with other members of the audience at a conference in 2005 – when Greg Velicer reported that he and colleagues had sequenced the genome of a Myxococcus xanthus strain that was part of an evolution experiment, in order to identify the mutations responsible for changes in its social behavior. Greg did that work while he was at the Max Planck Institute, so his funding was more generous than what most of us doing experimental evolution could afford. But it meant that genomics was becoming affordable for basic research. In 2009, Jeff Barrick and I published two papers that analyzed the genomes, not of single clones or pairs of samples, but from multi-generational series of 7 clones and 7 whole-population samples from one of the E. coli populations in my long-term evolution experiment. That seemed like a lot then but now, just a few years later, Lang et al. deeply sequenced 40 experimentally evolving Saccharomyces cerevisiae populations at 12 time points each! [Note added after comment: By “deeply sequenced” I mean the authors sequenced heterogeneous population samples, and they could thus follow the trajectories of specific mutational variants and genetic diversity over time.] The combination of experimental evolution and genomics is no longer a novelty – it has become a powerful and affordable tool that can be used as part of almost any project on experimental evolution. Our review paper begins by contrasting the design of two types of evolution experiments: mutation-accumulation and adaptive evolution. In the former type, the experimenter seeks to eliminate the effects of natural selection by forcing the populations through extreme demographic bottlenecks that purge genetic variation. (Remember: natural selection does not work in the absence of genetic variation.) In that way, one can estimate a mutation rate directly, by minimizing the otherwise confounding effect of selection on the observable rate of genetic change. (Of course, lethal mutations will not accumulate, although these typically represent only a small fraction of all mutations.) 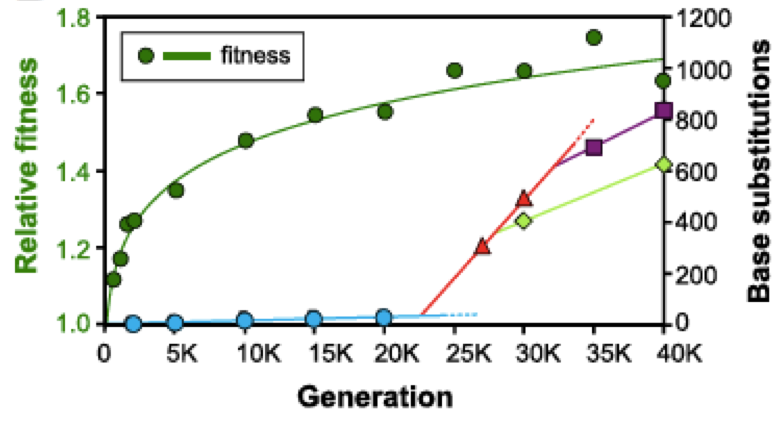 Whole-genome sequencing provides dramatically increased power and precision for estimating mutation rates because one can combine and integrate data across millions of base pairs and hundreds or thousands of generations. By contrast, older studies could detect mutations in just one or a few genes – chosen because they were known to cause specific changes in traits that could be readily scored – and they typically involved only a few generations of growth. Adaptive evolution experiments are designed to shed light on various aspects of the process of adaptation by natural selection. Genomic analyses of adaptive evolution experiments have allowed investigators to identify mutations responsible for interesting phenotypic changes, examine the extent of parallel evolution at the genetic level, quantify the dynamics of genetic diversity within populations, compare rates of phenotypic and genomic evolution, and address many other old and new questions. And these adaptive evolution experiments are becoming increasingly complex as many investigators are now studying systems with multiple species, temporally or spatially varying environments, sexual reproduction or horizontal gene exchange, and so on. Genomics will play a critical role in understanding these increasingly complex systems and scenarios. Our review closes by drawing attention to areas of research that aren’t quite experimental evolution, as the field is usually meant, but for which similar combinations of evolutionary and genomic analyses and interpretations will become increasingly important in the years ahead. For example, we think it won’t be too long before it becomes routine practice in genetics to sequence the entire genomes of any mutant or recombinant strain of interest and its parent, in order to be sure that the procedures employed did not inadvertently lead to other changes besides those intended. And we point out that the combination of genomic and evolutionary analyses is extremely powerful and interesting in the context of evolution in action in microbial pathogens (see this previous post for a compelling example). Jeff and I hope that many readers will find our Nature Reviews Genetics article a useful summary of a fast-moving field, a helpful primer at the intersection of experimental evolution and population genetics (especially for microbial populations), and a valuable lead to fascinating papers for further reading.